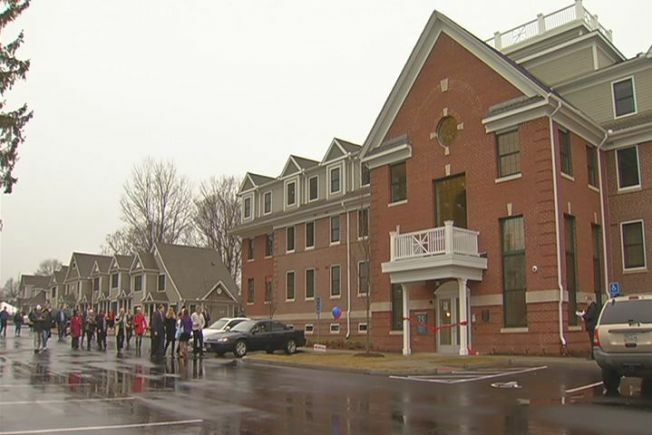 A 74-unit affordable housing complex for veterans and their families opened its doors in Newington today, and new residents say they've already made this place their home. Victory Gardens was built on land leased from the Veterans Administration in Newington by a private developer, the Women's Institute for Human and Economic Development. Construction began in September and the ribbon cutting took place today. Vietnam veteran Angel Lara and his wife Edna moved into Victory Gardens on Thursday night and are already settling in. "We're happy," said Angel Lara. "It's a quiet place with security. It's a nice place to be." Veterans started moving into new homes with rents below market rate in May. Some depend on support from the nearby VA hospital. Margaret Guillory-Allen, the woman who admitted them in compliance with the many regulations, described the new residents as "every day Joe and Jane Doe, people who come from a dismal past to their new beginnings." She added, "Victory Gardens is their way of heading to self-sufficiency." The VA regional director, Gerald Culliton, said another project, Veterans Landing, is in the works, with a groundbreaking perhaps a year away. Construction on Victory Gardens began last September.